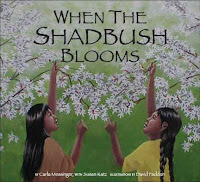 I was glad to see that When The Shadbush Blooms, the only "multicultural" book on IRA-CBC's list of nominees for the Children's Choice Awards, was lauded by Debbie Reese and Oyate. Maybe I shouldn't be surprised by the list -- the books were donated by publishers and chosen in six cities of the country not particularly renowned for a diverse demographic: Chico, California, Middletown, Delaware, Crete, Illinois, Starkville, Mississippi, Bellevue, Nebraska, and Omaha, Nebraska (here's a .pdf describing the process.) Of course, I've only been to Chico, which does have a fair share of immigrants, so maybe the other cities are home to all sorts of kids. Unfortunately, on the official Children's Book Choices site, there's no explanation of selection criteria to be found -- or maybe I'm missing it. The nominees are great, I'm sure, but this award reminds me that for kids and adults to venture outside the story comfort zone, we often need a nudge from a trusted source.